Düsseldorf, Museum Kunstpalast from 24 September 2011 to 22 January 2012. When German museums set up an exhibition, they usually do not do things halfway. After the sweeping retrospective on the Master of Naumburg which we discussed here (see the article in French), the current one on the Dusseldorf school, organized by the Kunstpalast which recently reopened (see the article in French) is just as dense since it presents about 450 paintings with dates ranging from the 1820’s to the early 20th century, thus covering almost a century of artistic creativity. The term of "Dusseldorf School" is sure to intrigue museum goers as not many people outside of Germany know it exists. Generally, art history in the 19th century, from David to Monet, is perceived as having taken place mainly in France and foreign artists are either ignored or looked down upon. Yet, Dusseldorf, as is the case of many other cities in Europe or the United States, was home to a flourishing art scene with international echoes. This was not a true "movement" since the styles were as different as the artists, but rather a "center" which gravitated around the Academy of Fine Arts. The figures alone are impressive : between 1819 and 1918, no less than 4,000 artists studied there. Among them : 700 foreigners which included 170 Scandinavians, 100 Americans, Russians, Dutch, Belgians, Swiss, Polish...No wonder then that many of them spread this art outside the German city, giving the Dusseldorf international stature. The exhibition focuses on this angle by displaying canvases by European and American artists trained at the Academy. 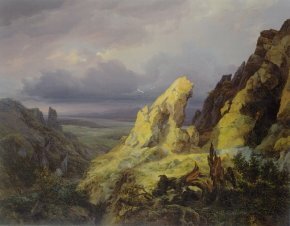 It also presents works by artists who influenced the German painters or who were connected in other ways to this school. 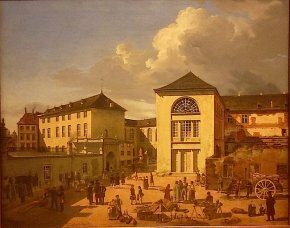 The Academy, founded in 1773, became the Prussian Royal Academy of Fine Arts in 1819, date at which Peter Cornelius was appointed the director until 1826. But it would be his successor, Wilhelm von Schadow, who would accompany the school during its most brilliant period. The Dusseldorf school thus first developed under the sign of the Nazarenes and the exhibition acknowledges this by offering an extensive number of paintings from this current born in Rome in the early 19th century. The hang, both thematic and chronological, cannot fully convey the evolution of the different styles. The various manners blend together, respond to one another, coexist in a non-exclusive way, always original but full of cross-references. One of the first rooms focuses on the Academy itself, showing workshop scenes, views of the Academy (ill. 1) and some of the more emblematic works of this current such as Agar and Ismael by Christian Köhler, a canvas which occupies the place of honor in the middle of a painting by Friedrich Boser representing The Presentation of the Dusseldorf Artists in the Grand Gallery of the Academy. 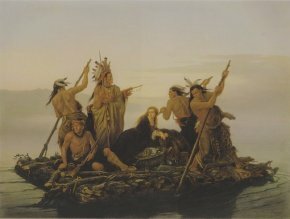 Then, the exhibition itself actually opens with a group of historical paintings which clearly demonstrate their affinity with the art described in France as "juste milieu" (between Romanticism and Classicism), a not very satisfactory term, applied essentially to Paul Delaroche and Horace Vernet. 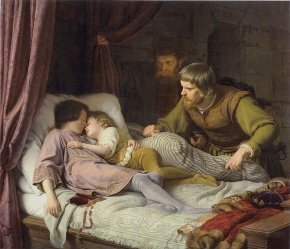 Delaroche is represented here with a painting from the Louvre, The Children of Edward, indispensable if only to illustrate its influence on the canvas of the same subject by Theodor Hildebrandt (ill. 2). The style is very close to that of the French painter, but the German artist chose a different moment for his composition. Whereas Delaroche leaves the viewer speculating as to the fate of the two children (a ray of light under the door and the watchful dog are the only clues that the executioners are about to enter), Hildebrandt shows the assassination just before it is to happen, making the scene even more horrifying but also less subtle. 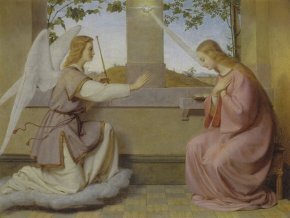 The painting, with several known versions, was just as famous in Germany as Delaroche’s in France. Other works reflect the importance of the latter. 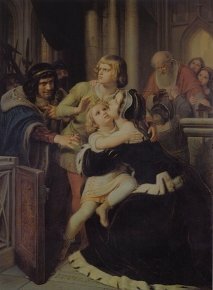 Hermann Stilke, originally from Berlin but who studied under Schadow, just like Hildebrandt, painted an earlier episode of the Shakespearan tragedy in 1850, where the two children are taken from their mother (ill. 3). As for Karl von Piloty, who was not part of the Dusseldorf school, but trained rather at the Munich Academy, his own treatment of the theme (in fact not as well done, and of lesser quality than other of his works) confirms that Delaroche was a model for certain German painters. Another painting which is attributed to Piloty, Seni Before Wallenstein’s Body was obviously inspired by The Assassination of the Duc de Guise. The exhibition then takes a look at religious paintings. We should not be surprised at discovering just how many there are, with Schadow and Cornelius being among the most eminent members of the Nazarene Brotherhood. 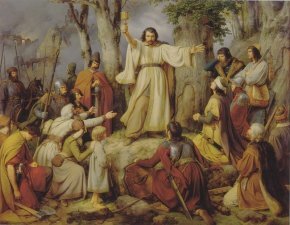 A work by the second, dating from 1813-1816, reveals this choice of naiveté which is one of the characteristics of the Nazarene style, and can still be found in the 1830’s in artists such as Carl Ferdinand Sohn, Julius Hübner and Ernst Deger (ill. 4). This aspect would disappear over the years and there is no trace of the naïf in Alfred Rethel who painted notably, a superb Nemesis (ill. 5) behind the features of an exterminating angel pursuing an assassin (evoking of course, but with a very different treatment, Prud’hon’s canvas) or in Edouard Bendemann who also reveals ties to Paul Delaroche. 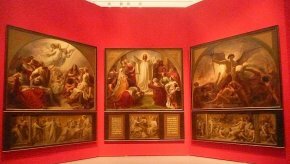 One work definitely stands out in this section : a triptych by Wilhem von Schadow (ill. 6), on deposit sine 1870 at the Palace of Justice in Dusseldorf and which has just returned to the museum after undergoing a complete restoration. Even if the workshop participated in this restoration, the ensemble is particularly beautiful and imposing. While the catalogue is organized according to chapters which help us to better understand the complexity of the many currents involving the Dusseldorf school, the hang in the exhibition, especially noteworthy for the beautiful colors of the walls and the abundance of the examples illustrating the 19th century Salons, is more confusing. We continue the visit on this floor then without seeking to explain the reasons for the presence of certain works, simply pointing out some of the more striking canvases. The catalogue points out what it calls the "monumental painters of Dusseldorf" ("Die Düsseldorfer Monumentalmalerei") which include Alfred Rethel, mentioned above, August Mücke and the excellent Carl Friedrich Lessing. Their battle scenes are more or less contemporaneous and very comparable to those in the Galerie des Batailles in Versailles. We reproduce here Lessing’s Hussite Sermon (ill. 7), particularly representative of his theatrical character. The exhibition continues in another wing of the same building with landscape painting where once again, the variety and number of artists, in certain cases the quality, is impressive. The Classical landscape is practically non-existent in the Dusseldorf school. These canvases qualify rather as Romantic, depicting stormy skies, massive rock formations, gothic ruins... (ill. 8). Strangely, Friedrich does not seem to have exerted any influence here. Some paintings, however, recall those of the Barbizon school. These landscape painters are as obscure as those of historical art. At times, they are one and the same, such as Carl Lessing, but more often than not they specialized in the genre. Andreas Achenbach produced true landscapes corresponding to the description listed above, but also some beautiful urban scenes, with a Bellotto-like precision, as in the one of the Academy reproduced at the beginning of this article (ill. 1) as well as seascapes similar to Gudin’s or Biard’s. 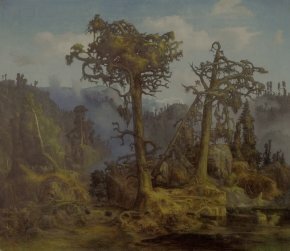 Some of the artists in this section reveal touches of the fantastic, for instance in the strange forms of the trees (ill. 9), others paint grandiose landscapes reminiscent of the Hudson school, not surprising as many of them settled permanently in the United States after leaving the Dusseldorf Academy. One of these was Albert Bierstadt. The exhibition also displays three paintings by Charles Wimar with figures of Indians (ill. 10). This German painter was born in Siegburg but spent his last years in Saint Louis, Missouri. On the other hand, Georg Caleb Bingham, represented here with one of his most famous works, lived in Dusseldorf between 1856 and 1859. 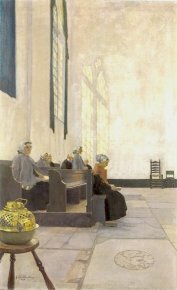 The second half of the 19th century is dominated by Realism and we admit that we were less taken by this part of the exhibition which presents scenes of either human misfortune (The Distraint by Peter Schwingen) or edification (The Service in the Prison Chapel by Wilhelm Heine). Dusseldorf even produced its "Impressionists". Some painters were indeed significantly affected by this movement, but at a later date as many of these are from around 1900. 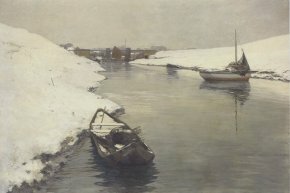 They include Helmuth Liesegang and Olof Jernberg who painted haystacks, Heinrich Petersen-Angeln who depicted a field of red poppies and Max Clarenbach a river with snowcovered banks (ill. 11). Monet was obviously not far from their thoughts and one of his canvases is in fact exhibited here. 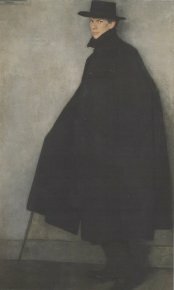 In concluding, we would like to point out two, though there are others, remarkable works : the portrait of Werner Heuser by Wilhelm Schmurr (ill. 12), a fascinating silhouette done in monochromatic blacks which reveals only the face with its piercing eyes and, Church Interior by Gustav Wendling (ill. 13). Michael Sichelschmidt’s Barges, dated 2007, reminds us that Dusseldorf is still a very active artistic center. This particularly beautiful painting recalls, whether on purpose or by accident, Willy Ronis’ famous Barge and Children, devoid of the human figures. It would be impossible to convey the wealth of the material presented in this exhibition even in a long article such as this one and we strongly encourage a visit to anyone interested in the 19th century. They will discover many artists who have been otherwise forgotten or never mentioned until today. We can only hope that once the show closes, the works will remain on display in the museum rather than returning into the storage rooms where they had been kept before the opening of this worthwhile exhibition. Bettina Baumgärtel (ed. ), Die Düsseldorf Malerschule und ihre international Ausstrahlung 1819-1918), 2 volumes, coedited by Imhof Verlag/Museum Kunstpalast, 2011, 784 p., 68€. ISBN : 9783865687029. An english version is about to be published. Visitor information : Museum Kunstpalast, Ehrenhof 4-5, 40479 Düsseldorf. Tel : +49 (0)211 8990200. Open every day except Monday from 11am to 6pm and Thursdays from 11am to 9pm. Tickets : 12€ (full price), 9€ (reduced rate). The work is reproduced backwards in the catalogue.